President Obama made a surprise visit to Afghanistan for talks with President Karzai. I’m sure he was a lot more polite with him than last week’s talks with Israeli President Netanyahu. 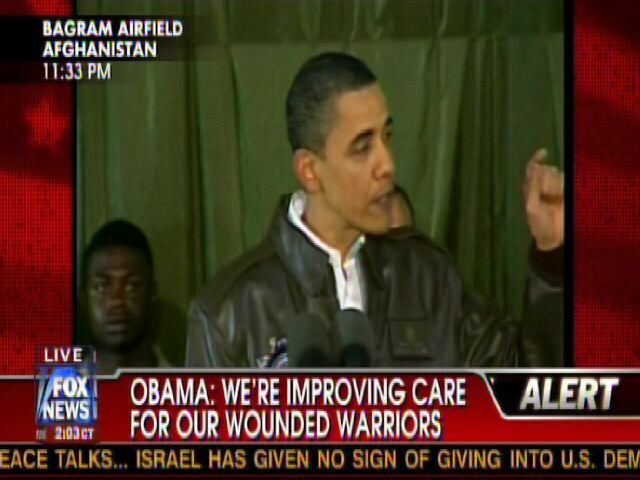 Obama then made a speech before about 2000 troops at the Bagram Airfield. There were polite cheers as he made his entrance at about 11:30PM and then proceeded to give a rambling, disjointed speech more about helping the wounded and respecting the fallen, than rallying their efforts on the battlefield. Obama’s discomfort in talking to the troops is apparent, as he apologized to them for being in this war. He spoke of his anguish of them being there and wished he could “order them home right away.” The President then proceeded to launch into a campaign speech and if you look at the face of the soldier to the left behind Obama, he seemed pretty bored by it all. President Obama never said anything about this being the finest military, the most disciplined or how they are destroying the enemy and liberating a country. Obama failed to inspire them and as Commander in Chief, he looks awkward, intimidated and totally overwhelmed. It’s always been apparent that Obama hates the military and he has never risen to the position of President. This speech was more about him than the men and woman sacrificing to defend our freedom. What a pitiful man this country elected to lead us.